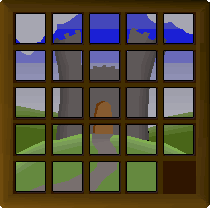 Puzzle boxes are given as an additional step to other challenges such as anagrams and cryptics. 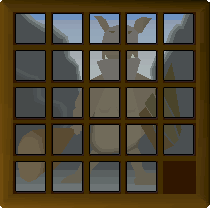 They're fairly simple to solve, and you must solve them yourself, unlike in Monkey Madness were you can pay a NPC to solve it for you. 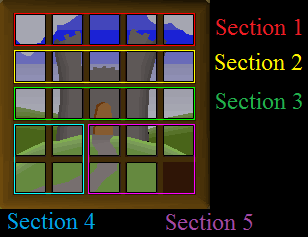 The key to solving them is to split the puzzle into sections, and solve each section. Once you've solved a section, do not move tiles from it. It's best to 'cycle' a group of tiles around, so they're in an order where you can move them into position one after another. i.e. 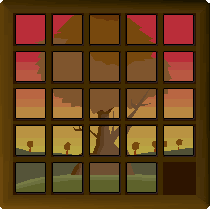 say a tile is in front of another one, but you need it to be behind for the puzzle to be correct. Basically you move the tile you want to move behind out of the group, then move the tile it should be behind in front of the point where you moved the behind tile out. Move the behind tile back in, and you'll have switch the tile positions so you can just move them into position. Apply the notion to all of the puzzle. To return to the general treasure trails guide, click here. For coordinate clues, click here. For map, cryptic, and anagram clues click here.